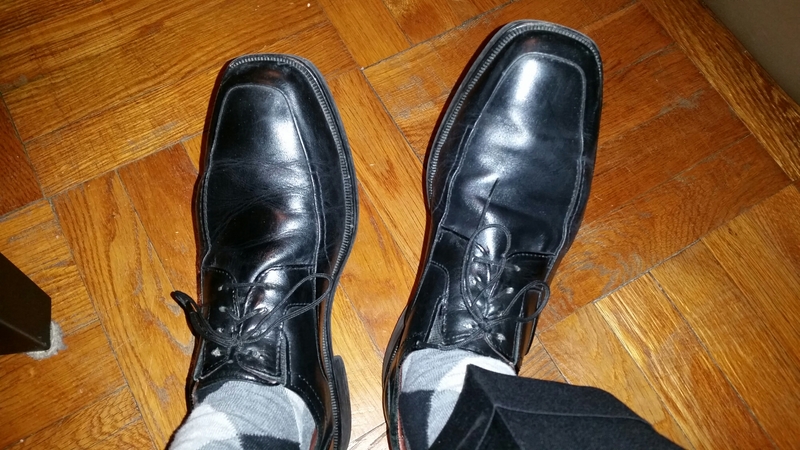 An old boss of mine preaches about men having their dress shoes well shined. It shows attention to detail that he likes on an employee. back when we worked together, they let a shoeshine man walk through the office selling shines. Yesterday, before I met up with some blog peeps, I went to Macy’s in NYC. I needed to get a white dress shirt. When I practiced making the Eldredge Tie knot a few weeks ago, I noticed that the two white shirts that I had didn’t fit in the neck. They were 16 & 1/2 and 17 inch necks and damn they were tight when I buttoned the top button. My dimensions are uncommon. A 17 & 1/2 neck but a 32/33 sleeve. Like dressing a T Rex instead of a G Rex. So it took a while but got it and wow 17 & 1/2 is MUCH more comfortable. 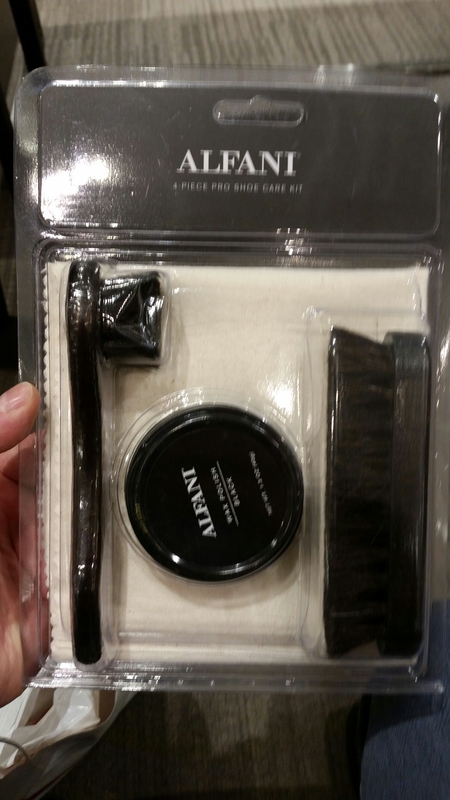 And while I was there, I bought a shoe shine kit. I believe it was my first time shining my own shoes with shoe polish. GRex is all grownz up. I was told by one of the lovely blog ladies that I saw yesterday, a fashion pro, that my Johnston & Murphy shoes are nice but Cole Haan shoes make that right impression. I do like those too, I’ve never been crazy about spending $300 on shoes, though I have been thinking about it. Maybe after I get a job. I do like my J & M’s. Very very comfortable. Next Blog traffic from “European Union”? And where is the shot of the fancy tie??? Yeah, I forgot to take a pic. Do you have DSW in NYC? They often have Cole Haan at a more reasonable price. It’s all that working out! I have monkey arms, sleeves are always too short on me.